Mojo is an all-black one year old male cat who got stuck very high in a tree in his own backyard. So high, in fact, that he could not go any higher. The limb he was on was supported by an almost vertical branch with no useful limbs, so going down was also impossible. This photo shows his location in the tree; he is the tiny black spot which I circled in red. This was going to be a challenging rescue. I had some difficulties getting my line in the tree and climbing up to him. I climbed up to the point where the main trunk forks to the left and right. At that point I was 16 feet below him, but I still had the most difficult part of the climb yet to do. It took me a long time to get to that point, and I was tired and found myself making lots of mental mistakes. At that point I decided it was not safe for me to continue, so I chose to abort the rescue attempt and come back the next day. The next morning I returned hoping that he had miraculously found his way down. But, no, he was still in the same place, and he had just spent his third night in that tree. I was better prepared for the climb, and since I had left my line in the tree from the day before, I also did not have to struggle with that part of the process again. As I climbed up to the fork of his limb, he showed some signs that he was happy to see me and would be friendly with me. But when I got close to him, he stayed out of my reach, and I could not climb any higher to get any closer to him. I tried to lure him closer to me with food, but he would not budge. The only option I had at that point was to use the rescue-pole. I worked the noose of the rescue-pole around him trying to get it behind his front legs. It took me several minutes to do it, but he finally gave me a good opportunity, and I closed the noose around his chest just behind his front legs. I lifted him up and transferred him to a net hanging by my side. After the long descent, we took him inside his house and released him. It took him a few minutes to calm down and figure out that he was at home and safe again, and then he was ready to eat and get some good sleep. Unfortunately, there is no video of the rescue because some klutz forgot to clear the memory card beforehand, and the camera ran out of memory well before I got anywhere near Mojo. 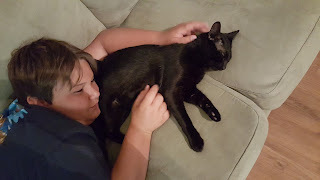 Fortunately, his owner sent me this picture afterward of her son and Mojo showing the bond between these two best pals who are both happy to be together again. This is why I do what I do.